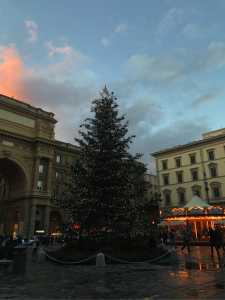 SAI recently caught up with with SAI Ambassador Emily, who answers some questions about her time in Florence. My favorite thing about my host city was finding the local spots. Tourist traps can be easy to fall into. While you definitely want to explore everything that TripAdvisor may suggest, you’re there for four months. I actually saved things like climbing the Duomo and visiting the inside of Santa Croce for when my family visited. Before that, my friends and I spent a lot of time exploring local places suggested by our Italian professor. Finding small local restaurants were where we really got to experience the city. The prices were better and the food was an authentic Italian dining experience every time. 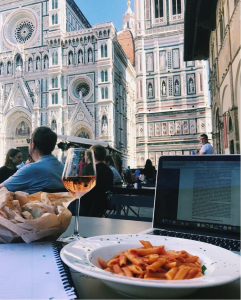 Nothing compares to the food in Florence, so we wanted to make sure we left no restaurant unturned. Studying abroad has only made me want to travel and explore the world even more. Learning about different cultures and people around the world gives you a brand new perspective on the world and on your own life. I have always had a passion for travel, but being independent and doing it on my own helped me grow as a person. Since I left Italy in December, I have been back to Europe, visiting Spain. With each trip, I find new things to learn, foods to try and people to meet. The more I travel the more well rounded I become. Europe has so much incredible history to learn and places to explore that I didn’t previously know existed. Take in everything each city has to offer. Go to every museum, restaurant and cathedral because each place will teach you something new. Emily was a fall 2017 SAI Florence student from Muhlenberg College.